There are many benefits of Pilates for children, it's not just for adults anymore! Children learn body image by watching others and generally comparing themselves to other people. I practice Pilates with my young daughter so she develops a healthy appetite for exercise as she ages. Sometimes she even initiates the practice like she's doing in the video here! 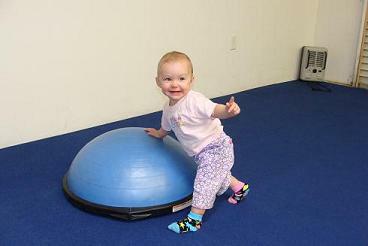 Exercises like rolling is fun for baby and a very challenging core exercise for mommy. Pilates for children can teach them in a safe environment that every body is different and that we can all embrace our bodies difference's things. The beauty of Pilates is that each one of us may perfect a movement that someone else cannot do as well. The child can then act as a model to help others who cannot perform the exercise as well. In this way they can build confidence and be more aware and sensitive to the needs others. We may think of ourselves as losing flexibility as we age. If you don’t work on it you lose it! Children have that advantage over us of youth and suppleness. So, why work on flexibility if you already have it? The trouble is if you don’t continue to stretch and strengthen your muscles as you age you will lose that suppleness, which can lead to sports and play related injuries as a child. We can actually keep our kids injury free by keeping them flexible and instill that sense of lifelong fitness in them. Many of us adults have developed faulty movement patterns as we’ve aged which leads to bad posture and related back conditions that keeps the chiropractors in business. Age-related poor spinal alignment can lead to bad postures, which can be offset by teaching children about correct movement patterns. Especially true for those kids who are developing scoliosis. Pilates for children can help them learn how to move gracefully and efficiently using their bodies without stressing the back and joints. They can further develop their bodies as they age helping to offset some of the negative effects of gravity as the body ages and the spine and joints start to deteriorate. 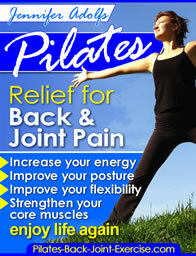 Pilates exercises help to realign and strengthen our muscles and joints. By improving children’s posture and body coordination as they age they will develop better balance skills and body awareness that will carry through into adulthood. Balance and coordination can improve a child's sports skills. If you hope they might be the next Tiger Woods or Kobe Bryant then get them doing Pilates. Pilates core exercise is the secret of success to many of these very athletic and coordinated sports stars. My daughter learned to balance early on by using exercise balls, like this bosu, to develop her coordination and strength for walking. She was walking by 10 months and running well by 1 year! With the increased cases of hyperactivity in school allowing children to move and use their bodies can actually stimulate brain power and focus. Not just children but all of us need to move to release healthy energy. When we keep it suppressed it’s harder to slow down and concentrate. A healthy body is an energized body and this increases stimulation to the brain allowing our children to focus in school and to sleep better and more soundly at night. 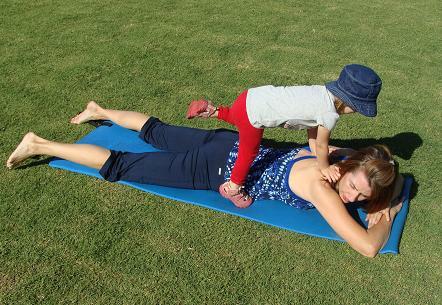 Pilates for children can be a fun and creative time. They can create stories out of the movements and practice teaching the class. Props such as balls, flex bands, foam rollers, and fitness circles are sometimes included in the class formats for more stimulation and interaction. Small classes work best for social interaction and play. Look for classes at your local gym or YMCA. If there are not specific classes for children ask the instructor if they might start one. Unfortunately today’s children are the most inactive generation in history. Approximately 15.3 percent of children ages 6 to 11 are obese and more than double that number are overweight. One factor contributing to childhood obesity is the increasing sedentary lifestyles. Unfortunately our advancement is our kids downfall! Computer technology and not playful movement stimulate this generation of kids. It’s important that we practice what we preach staying active and healthy so we can act as good role models for our kids. The benefits of Pilates for adults is becoming more well known as millions of us are flooding classes and studios around the world seeking its benefits. So, if we adults can see benefits why not Pilates for children as well? Let’s inspire our children to move and feel better too! Leave Pilates for Children and check out the new Pilates ebook to get your child started today with some basic exercises.